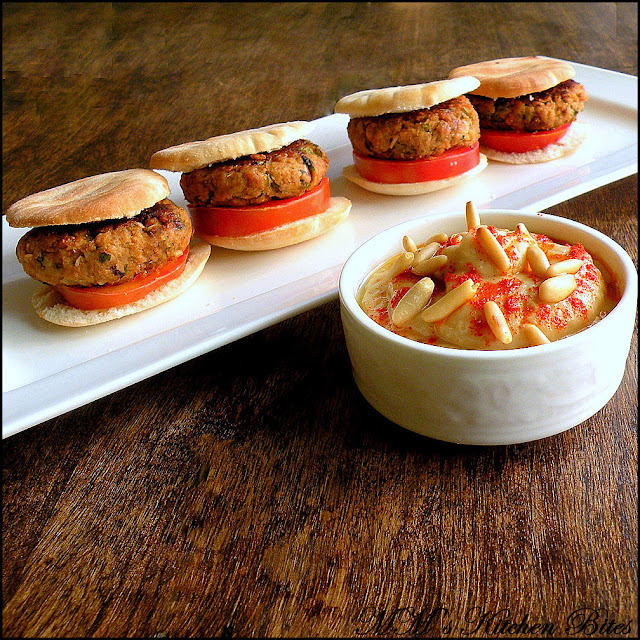 MM's Kitchen Bites: Pita Burgers...small on size, not taste!! Take a large glass bowl and add the meat, onion, fresh coriander, yogurt, cumin powder, coriander powder, black pepper, paprika, garlic, ginger and oil. Don't add salt at this stage. Mix everything thoroughly with a spoon and cover the bowl with cling film. Mix with a light hand - overworking the mince will end up toughening the meat. Let the mix marinate in the refrigerator for an hour or so (or overnight). When ready to make, add salt and lightly stir it well. With wet hands or an ice-cream scoop or a large spoon, portion the chilled mix and shape into equal size patties. Heat a large nonstick skillet over medium heat. Coat pan with oil or cooking spray. Add patties to the pan and cook for about 5-7 minutes on each side or until done to your liking. You can alternatively grill or bake these in the oven. Toast the pita breads lightly and slice them in half to separate. I used lamb meat. If using chicken or turkey mince and cooking over gas/stovetop/grill, add a couple of tablespoons of couscous or fresh breadcrumbs to the mix so that the patties don’t break. It is best not to use lean mince as the fat helps to bind the burgers and keep them moist. Do check for seasoning before shaping into patties - pinch a little meat and cook on a skillet or microwave to do a taste check. look yummy.I'm sure my kids are going to love them.